Book an initial Workplace Wellness Review and to find out how our programme can benefit you and your team while saving you money. Providing a safe working environment is an employer’s legal requirement (The Management of Health and Safety at Work Regulations 1992). For office-based workers, the employer’s responsibility goes beyond buying the right equipment and furniture. It is essential that employers ensure that their valued employees are interacting with their work environment in a way that minimises risk of repetitive strain or injury. 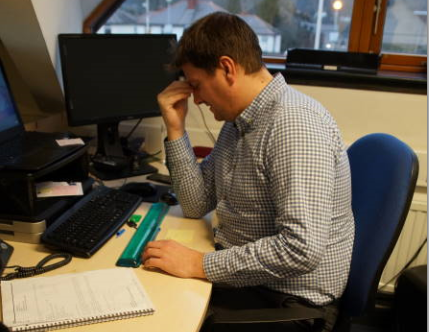 As physios, we spend much of our time treating office workers whose symptoms could easily be avoided. What does an Office Ergonomic Assessment entail? *We assess each employee’s current work habits and postures. *We address any problems and make any adjustments or changes needed. *We encourage good habits and postures by educating employees about the impact of poor postures and incorrect office set up and habits. *We advise on any lifestyle changes that are appropriate. *We send the employer a full report on each employee noting any issues, any action taken and any recommendations. We have visited many offices to help ensure best practice. Surprisingly, regardless of the quality of chairs, desks and equipment; it is rare to find anyone who has exactly the right set up, postures and work habits. This is usually due to a lack of knowledge about what is correct. By making simple adjustments and alterations, we can enhance employees’ comfort and reduce their risk of acquiring or aggravating any work-related injury. Usually this can be achieved at no additional cost to the employer. When there is a need for any equipment, we can recommend affordable options.